International Steel Span® is the world's leading steel building manufacturer of truss-less pre-engineered, easy to assemble, arch-style steel buildings. International Steel Span steel buildings have been constructed in Europe for decades. We are the original metal building pioneers. We are the original steel building pioneers - all others in the industry are imitators! We invite you to visit our plant in McKees Rocks, Pennsylvania, U. S. A., which is one of the most sophisticated steel building manufacturing plants in the world, using state-of-the-art machinery and robotics to maintain the highest standards of quality control. International Steel Span steel buildings offer superb value and cost savings compared to similar products being used for building structures world wide. How? Because we are a results oriented company with our key initiatives focused on continuous improvement. Our mission is to produce the highest quality arch-style steel building in the world by the most efficient manufacturing and operating processes. We constantly search for significant gains in operating procedures to lower cost while maintaining our high quality standards. We recognize continuous improvement as the engine that will drive our growth and the key to gaining our long term competitive advantage in the market place. 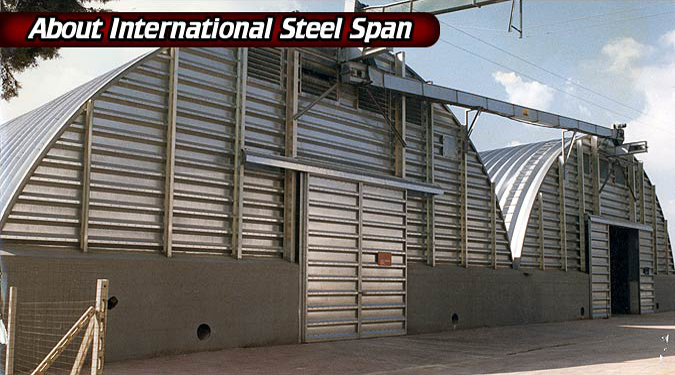 International Steel Span steel buildings are precision engineered to meet the European Building Code as well as the German DIN-Norm. All of our component parts are precision manufactured to exceed industry standards. In addition, arch-style buildings are ecologically friendly and are highly sustainable products. International Steel Span steel buildings have been constructed in Europe for decades. Our buildings serve distinct market sectors and applications throughout the world. Arch-style buildings are extremely popular in the agricultural industry and used for grain storage, livestock shelters and farm equipment. Other uses include light manufacturing, warehousing and operations distribution. International Steel Span has designed Arch-style buildings to serve as aircraft hangars for small airplane storage. Residential uses are also very popular, including workshops and automobile and recreational vehicle storage. Most important, International Steel Span steel buildings are do-it-yourself, consisting of one universal nut and bolt for all building connections and only three primary component parts. We specialize in high quality, 100% made in the USA steel buildings, manufactured with hi-tensile, commercially coated Galvalume® steel, the highest quality, heaviest gauge commercial U.S. steel available in the world and backed by a 40-year rust-through perforation warranty. International Steel Span is serious about quality and customer service. We supply a superior technological product with respect for our workers and the environment. International Steel Span's goal has always been 100% customer satisfaction, while constantly looking for ways to improve our buildings. Every International Steel Span building is designed and tested to the highest standard of quality and is engineered to withstand the most severe weather conditions, including heavy snows, high winds, earthquakes and even hurricanes.